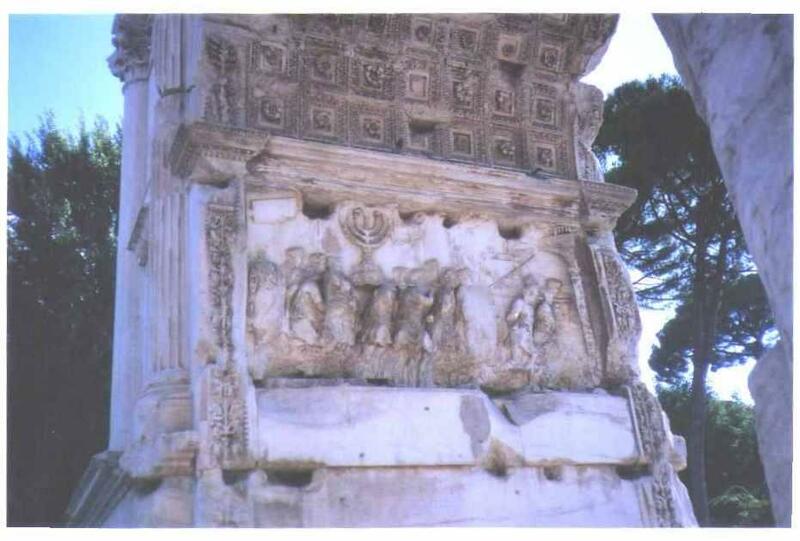 The Roman Empire was the enemy of the Jews, yet Rome erected an important monument to Jewish history, which was preserved more or less intact by subsequent rulers of Rome, up to today's Italian Republic which devotes great resources to preserving, exhibiting, and sometimes restoring the many antiquities in the country. The Arch of Titus is especially important nowadays when the Arabs and the pro-Arab Nazi forces, sometimes described as "leftists" or "democrats" or some other conventionally innocuous term, are trying to deny that there is such a thing as Jewish history or that the Jews ever existed before Theodore Herzl, while they especially try to deny or minimize any Jewish history in the Land of Israel. 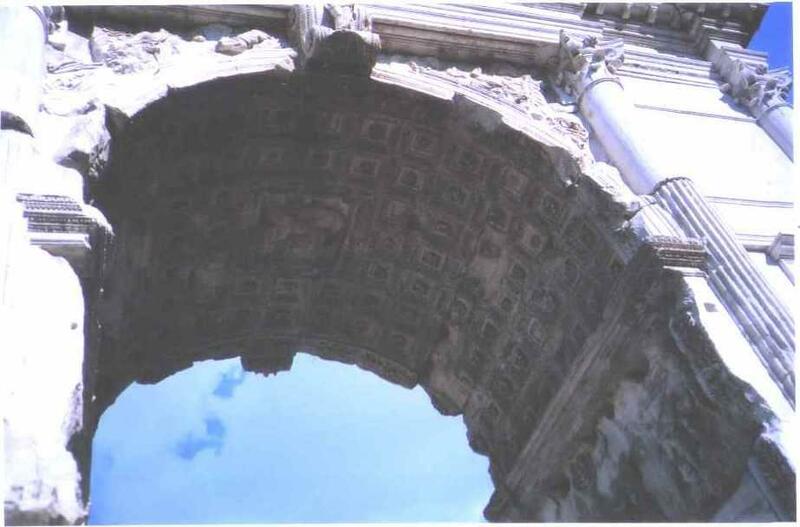 The Arch of Titus was built by the Flavian emperors, Titus and Vespasian, who had led the Roman armies against the Jewish freedom struggle in the province of Judea [PROVINCIA IUDAEA] and had besieged Jerusalem in the year 70 CE. This historical episode is mentioned and described by Josephus Flavius, a Jewish renegade who went over to the Roman side, in his book The Jewish War [De Bello Iudaico]. It is also described by Roman historian Tacitus in his Histories, and by other ancient writers. Tacitus points out that Arab auxiliary troops fought for the Romans against the Jews [see an earlier post on this blog for the text in Latin and English]. The ancient Arabs had this habit of collaborating with imperialists, although the current semi-scholarly orthodoxy in Middle Eastern studies would not want to give any attention to that fact. These two emperors were called Flavians from their clan or gens name. Josephus became their protege and took on their clan name Flavius. 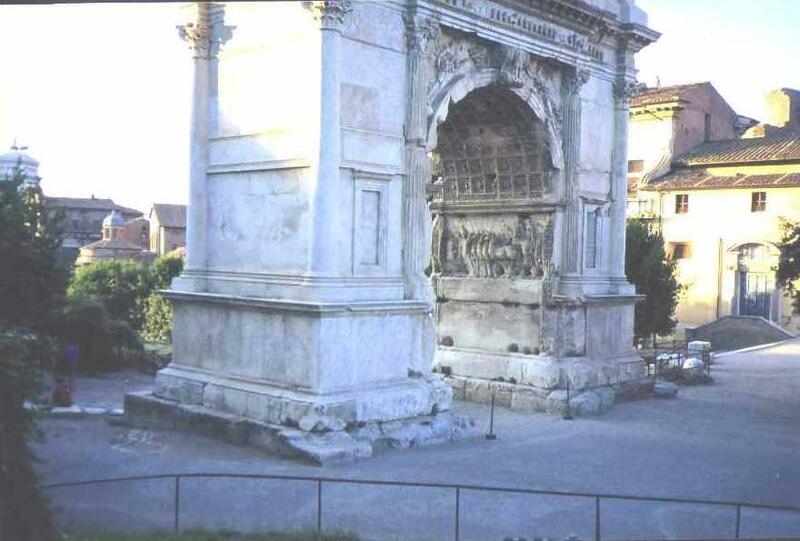 Here is a picture of the Arch of Titus taken from the west side looking east and up, and slightly to the south, the famous menorah may be visible with difficulty (click on photo to enlarge it). Here's another picture, from a different angle. The shot was taken from the steps leading up to the Palatine Hill, just outside the fence enclosing the main Roman Forum. This photo was taken from the south side and shows the bas relief of an award being given to the emperor for winning the war. And here above is the bas relief on the south side of the interior showing the famous menorah. According to some, the menorah is being carried by Jewish captives, while others claim that it is being carried by soldiers. In Latin the arch is called Arcus Titi, in Italian Arco di Tito, in French Arche de Titus or Arche de Tite, and in Hebrew שער טיטוס Sha`ar Titus. The Arch of Titus, erected to commemorate the victories of Titus and Vespasian in the Judean War ending with the destruction of the city and temple of Jerusalem A.D. 70 [= 70 CE], was not completed until after the death of Titus and dedicated by Domitian A.D. 81. This splendid arch entirely faced with pentelic marble is one of the gems of the first century. The vaulting is decorated with rosettes in richly carved coffers and by splendid reliefs of the highest interest. On one side is represented a triumphal procession with captives and soldiers carrying the Jewish spoils including the table of the shew-bread and the seven-branched golden candlestick [menorah]; opposite is seen the emperor Titus in a triumphal quadriga, driven by the goddess Roma while Victory holds a crown over his head. 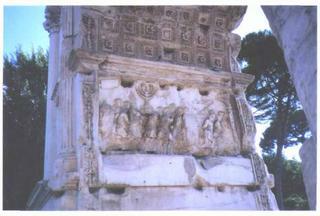 The relief in the centre of the vault represents the apotheosis of Titus who is carried to heaven by an eagle. Note: Vespasian was father of Titus and became emperor in 69 CE while leading his legions against the Jews. Titus took command when his father became emperor and unfortunately concluded the war with success, although the last Jewish fortress, Massada, was not taken until 73 CE. Domitian too belonged to the Flavian dynasty; he was a son of Vespasian and brother of Titus. Vespasian, according to the Petit Larousse, "pacified Judea, built the Colosseum . . . and erected the Temple of Peace." This temple was in fact devoted to the victory over the Jews and contained objects looted from the Holy Temple in Jerusalem by the Romans. That was what "peace" meant for the Romans. This all shows that defeating the Jews was very important for the Roman Empire, and that the imperial class considered it a great victory. Obviously, the Jews were much more important in ancient times than most standard historians would like to acknowledge, especially most of those identified as "leftists" [consider Gibbon's effort to belittle Jews]. The Romans issued several different coins in honor of their victory over the Jews, and this over a period of 25 years. The most common inscription on these victory coins is IVDAEA CAPTA, while others are IVDAEA DEVICTA or simply IVDAEA, etc. The coins were minted in gold, silver, and bronze. These coins too are signs of how important Rome considered victory over the Jews. 1) Several years, a large stone was dug up near the Colosseum in Rome with an inscription indicating that it was built with money looted from the Temple in Jerusalem. It was on display in the Colosseum for about a year or two. I do not know its present location. 2) Tacitus points out that Arab auxiliary troops helped the Roman legions in this war [see an earlier post on this blog]. Here we have Arabs fighting on the side of an empire against the freedom struggle of another people. 3) Judea [= IVDAEA] was the Roman name for their imperial province that more or less covered the territory that the Jews have long called the Land of Israel. In the Christian New Testament, Judea is also used in a narrow sense meaning the southern part of Israel, what the Jews call Erets Yehudah. However, in Latin and Greek usage Judea included the Golan Heights, Galilee, Samaria, northern Negev, and the east bank of the Jordan River.